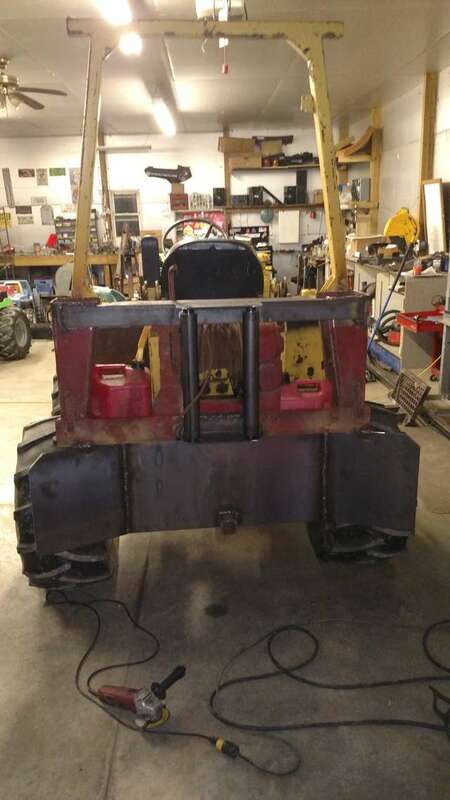 Started with a Vermeer V440 trencher, 60hp Perkins 4 cylinder diesel, 3 speed, Dana 70 axles, 31/15.50/15 tires, added hydraulic Chevron wrecker winch, built 3/8" log bumper, made my own fairlead rollers with 2.5" diameter and 1" shafts. Working on cage now. Have to work on blade, add saw scabbards, wiring and lights, etc. Due to short wheelbase I didn't go with an arch, lots of hilly terrain here. This thing might weigh 4000# when done, not sure. Plan to fill the tires also. Thinking chain chokers will be my best bet for this machine? Technical difficulties... I am not a fan of the photo process here! I like it. Do the rear wheels steer or only front? Maybe add some ribs to the apron for strength? Thanks guys, front wheel steer only. I'm currently trying to fabricate a new lower control arm for the blade, it's overly complicated itself somehow... It was missing that piece when I got it and finding good pictures online is not proving to be possible, figuring out the geometry is tricky because I'm not sure how much up or down travel it originally had, and the cylinder I'm using is not the original lift cylinder and I'm pretty sure it's identical but have no proof. So it's like reverse engineering it trying to figure it out. Also I'm not sure how much screen to add to the cage, I screened the back to protect against winch cable failure. Figured I'd put some on the sides also just not sure how much. I'm loving the looks of this thing! As soon as I get blade figured out I'll take it outside for pics in good light. Can't wait to get this thing out and see how it does! Do not climb any higher your comportable falling ! 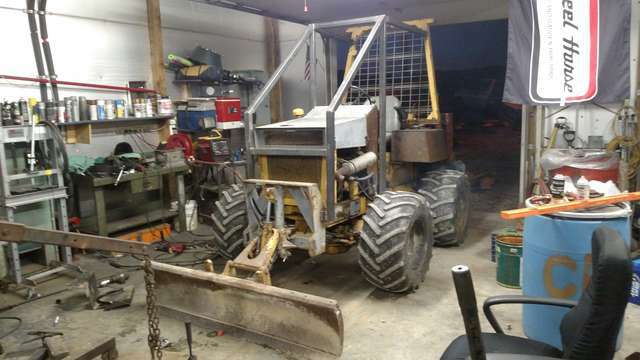 Those old trenchers make some cheap mini skidders for somebody who has some fabricating skills. The 2x2 square tube for the receiver hitch i would have welded in flash. Good chance it gets dinged up and your hitch won't fit anymore and you would have to leave the trailer back in the woods. Make sure you know how to fall properly when you fall and as to not hurt anyone around you. Also remember, it's not the fall what hurts, its the sudden stop. !! Looks good. Make a place to tote a gallon of gas and oil. And have a box to put wedges and other tools in,don't forget a place for the saw. get a hold of autocar. 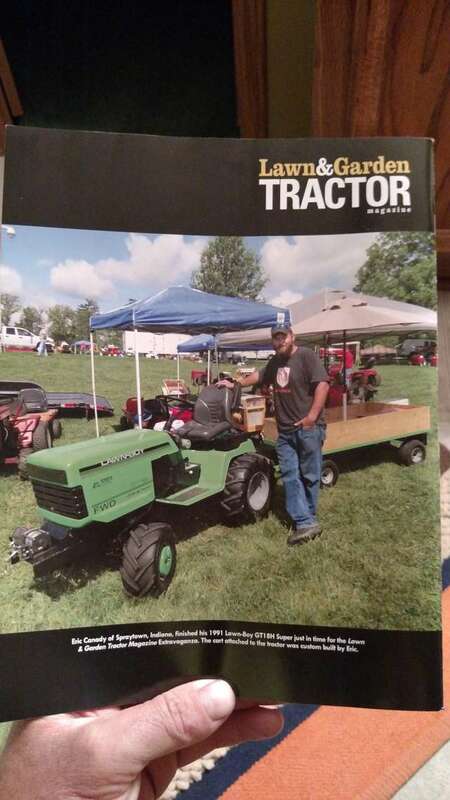 he has one heck of a nice skidder he built out of the same type of machine you are startin with. his is pretty impressive. 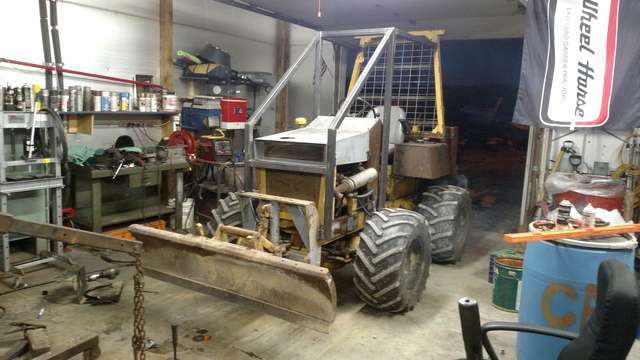 that a duetz garden tractor? looks able. Thought about flush welding it but reaching under the bumper to pin it would be a huge pain. 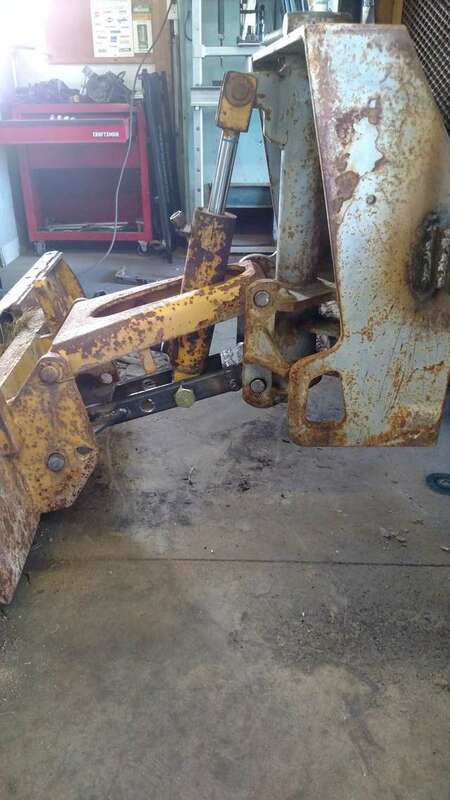 I'm not too concerned about it getting banged up, and I'm not going to be using the hitch for anything in the woods, just occasional spotting a trailer around my yard or whatever. Thanks, I've already got fuel and oil storage worked out and made saw scabbards just need to mount them. Definitely planning a small tool box which I have just haven't decided on place to mount it yet. Thanks I'll look him up! I'm always hunting for ideas! 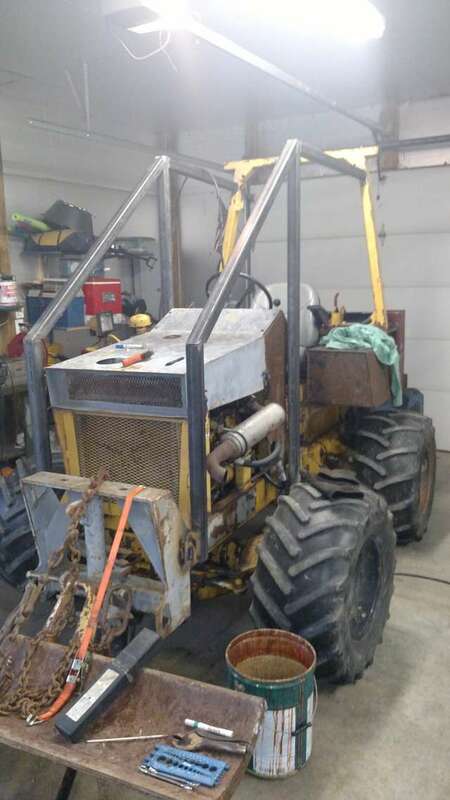 [/quote]that a duetz garden tractor? looks able. Got screen on back and fabbed up a lower control arm that was missing for the blade, plumbed it all in, and tried it out. Pretty sweet! Has hydraulic angle too. 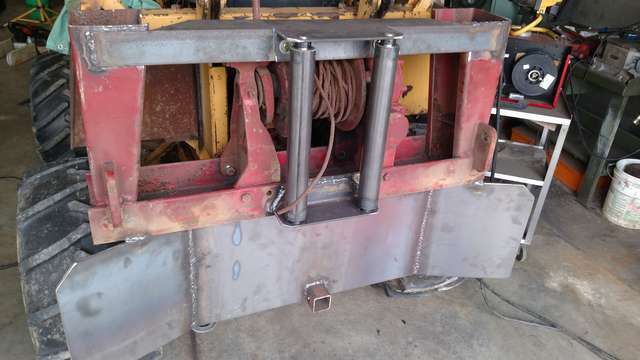 Haven't put the steps back on yet, I'll need to notch them out for the cage uprights. One gallon can on right will be for bar oil. These fit perfect and snug! Like they were made to go there! Did a gallery search and found his. Nice machine, I read his post on it before come to think of it. That is one sweet rig! I will make an effort to look you up next time I am back in your neighborhood! I'd like to see that thing in person. 1983 LT 30, 1954 Ford NAA, 2006 Polaris 500 EFI, '03 Dodge D2500 Cummins powered 4X4 long-bed crew cab, Cummins powered '88 Chevy R30, Stihl MS250, MS311 and MS661--I cut trees for my boss who was a Jewish carpenter! Nice rig and nice job! Somewhere 20 miles south of Lake Erie. 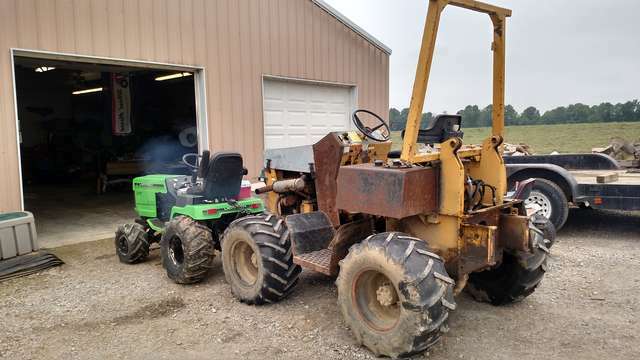 New mini-skidder, what do you think? Page created in 0.935 seconds with 39 queries.